All of our bread is naturally leavened using a wild sourdough culture. We use only organic grains and mill our flour fresh. The bread is delicious, nutritious, and very easy to digest. When you become a Bread Drop member you choose one of the following two categories. Just give us the basic parameters and we'll come up with something delicious every week. If you love all kinds of bread, and feel fine eating modern wheat varieties as long as they're properly fermented, then this is for you. This option includes loaves that are up to 50% sifted flour like our much loved “White(ish) Bread,” as well as heartier whole grain loaves. You'll get modern wheats, ancient grains, sprouted grains, white flour, buckwheat flour, whole rye flour, and everything in between. Many people are finding that they feel best when eating grains that are a bit easier to digest, such as ancient, sprouted, or non-wheat grains. If you have a wheat or gluten sensitivity but still love bread when it's made just right, this option could be perfect for you. You'll experience a vast world of breads that taste amazing and make you feel good too. 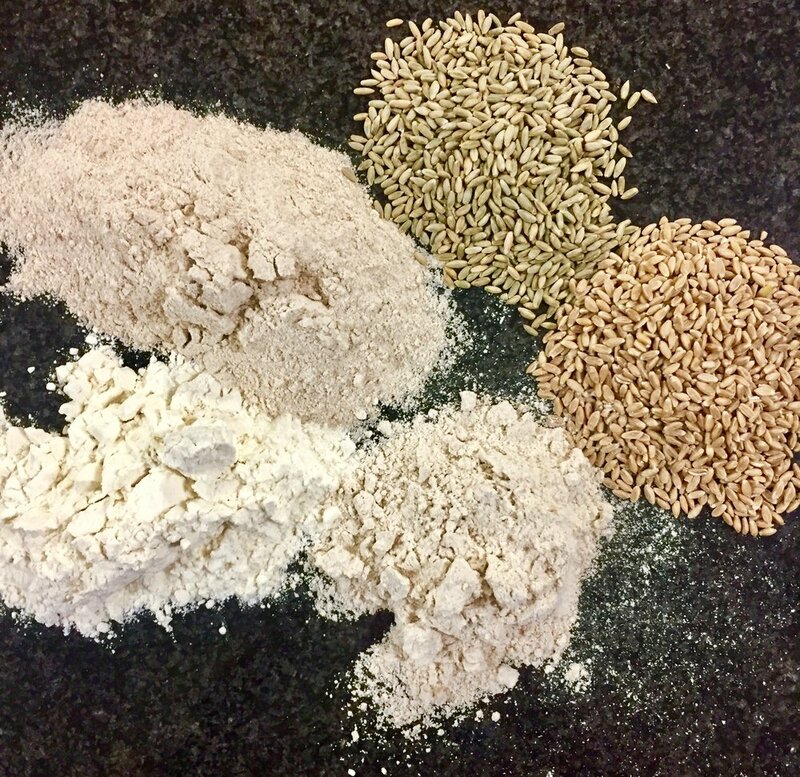 We use einkorn, spelt, emmer, quinoa, and kamut, as well as sprouted grains and alternative grains like rye, oats, barley, buckwheat and more. Some of your loaves will be lofty and light in texture, some will be more dense with wonderfully robust flavours. All of your loaves will be 100% whole grain and at least 50% freshly milled. These are a few of our loaves that frequently make it to market with us. We make many breads with various additions and are always coming up with new recipes. Come to the market and see what we've got for you! Einkorn is considered the oldest variety of wheat on the planet, meaning it has never been modified and is exceptionally nutritious. This loaf has a unique depth of flavour and is a favourite of our customers who have gluten sensitivities. 100% fresh-milled rye. Made in a dense Danish style with coarsely cracked rye berries, this loaf has a rich and complex flavour that tastes amazing as the base for a toasted open-faced sandwich. What sets this apart from other white sourdough breads is ours contains 50% freshly milled whole wheat! This loaf features an extremely moist open crumb and a chewy crust, as well as substantial whole grain nutrition. Though made with a sourdough culture (like all of our bread) it has a delightfully delicate taste. This loaf of 40% freshly milled rye, 40% freshly milled whole wheat and 20% unbleached flour is a perfect hybrid of our Danish style rye and the White(ish) loaf. Light in colour and texture, it combines the irresistibility of our white bread with the taste and nutritive value of whole rye. This loaf is made with 100% sprouted spelt flour. This is not only one of our most easily digested loaves, but one of the tastiest as well. A great choice for anyone with a sensitivity to wheat or a love of sprouted grain. Our whole wheat loaf is made from a rotating roster of select wheats, always milled fresh and unsifted. Grain varieties include Hard Red Spring Wheat, Hard White Wheat, as well as the Canadian heritage wheat, Red Fife. Also look for our "Marquis Rouge" - this loaf is 100% Marquis wheat from Cedar Isle Farm, milled fresh, and grown right here in the Fraser Valley.